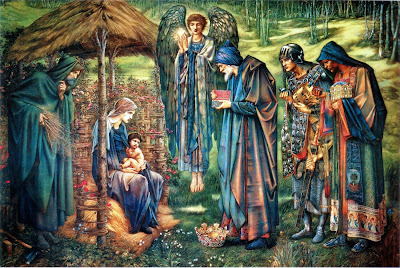 Next Sunday, 30 December 2018, is the First Sunday of Christmas. For many people in church, next Sunday’s Gospel story (Luke 2: 41-52) is likely to seem out of sequence and out of place in the Christmas cycle of Gospel stories. 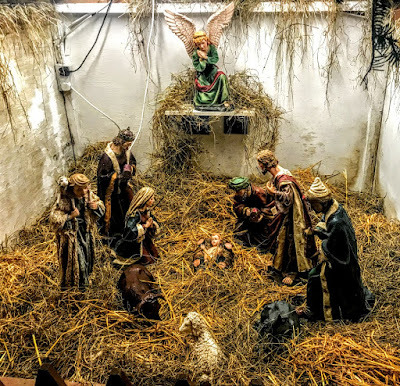 So, people listening on Sunday morning may wonder how we are jumping from the story of Jesus’ birth in a stable in Bethlehem on Christmas Day to the story of the teenage Christ who is lost in the Temple on this first Sunday after Christmas? The missing years or silent years in the story of Christ have long been a puzzle. It is good to remember that Saint Mark and Saint John begin the story of Jesus with his baptism by Saint John the Baptist, while Saint Matthew skips from the return to Nazareth from Egypt to the baptism in the River Jordan. Saint Luke is alone among the Gospel writers in telling us a story from the childhood or teen years, told in this moment of transition from childhood to adulthood. 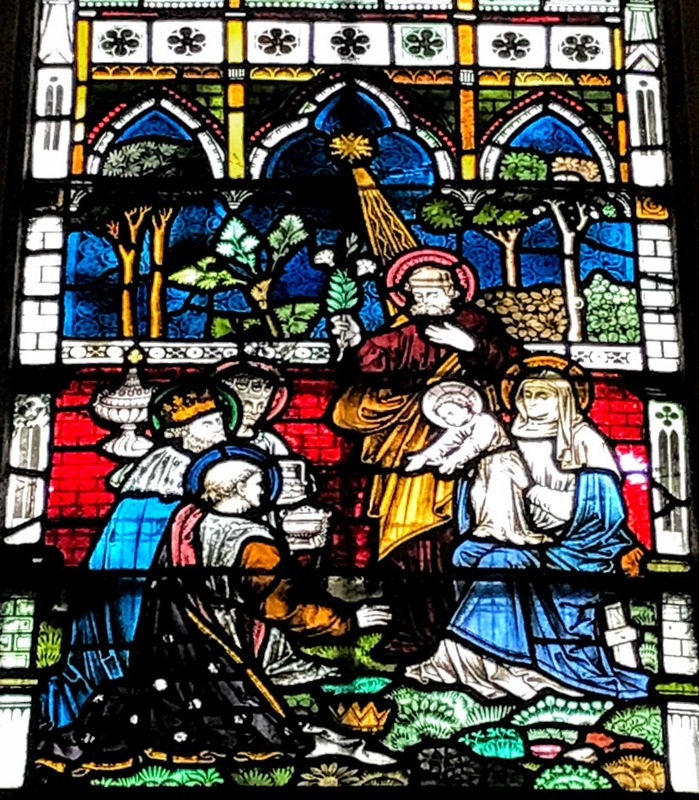 This reading closes the introductory portion of Saint Luke’s Gospel, the ‘Christmas cycle’ that begins in Chapter 1, takes us through the conception and birth of both Saint John the Baptist and Jesus, the circumcision and naming of Jesus, and his presentation in the Temple. 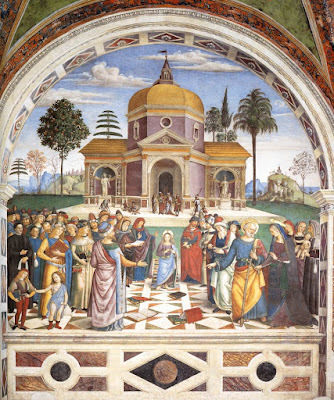 This story completes the early identification of who Jesus is in Saint Luke’s Gospel. The Angel Gabriel tells the Virgin Mary that her child will be ‘holy’ and will be called the ‘Son of God’ (1: 35). At the presentation, he is identified as ‘holy’ in 2: 23. Now, in this episode, he is identified as God’s Son. 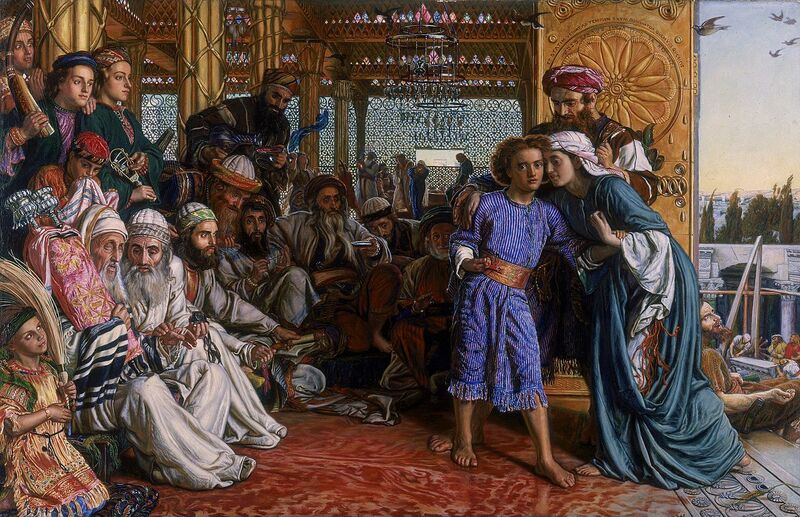 In the Old Testament reading and the Gospel reading, parents living in a provincial town go to the Temple to worship and there they find their young sons ministering in the Temple. In the story of Samuel, the young boy is in the Temple serving the Temple liturgy (as the Septuagint renders it), while in the Gospel the teenage Christ is among the teachers or the rabbis, debating, listening and answering. But where do we find Christ, where do we seek him, where is God’s Temple? The Psalm (Psalm 148) is a call to praise God’s name, but also reminds us that God’s splendour is found throughout earth and heaven (verse 13) and in people (verse 14). 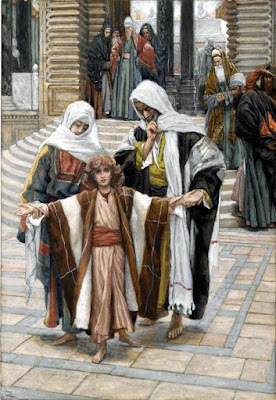 Samuel is clothed in boy-sized priestly robes made by his mother, perhaps the young Jesus has just donned the traditional prayer shawl for the first time as a teenager, which binds him to the Law. 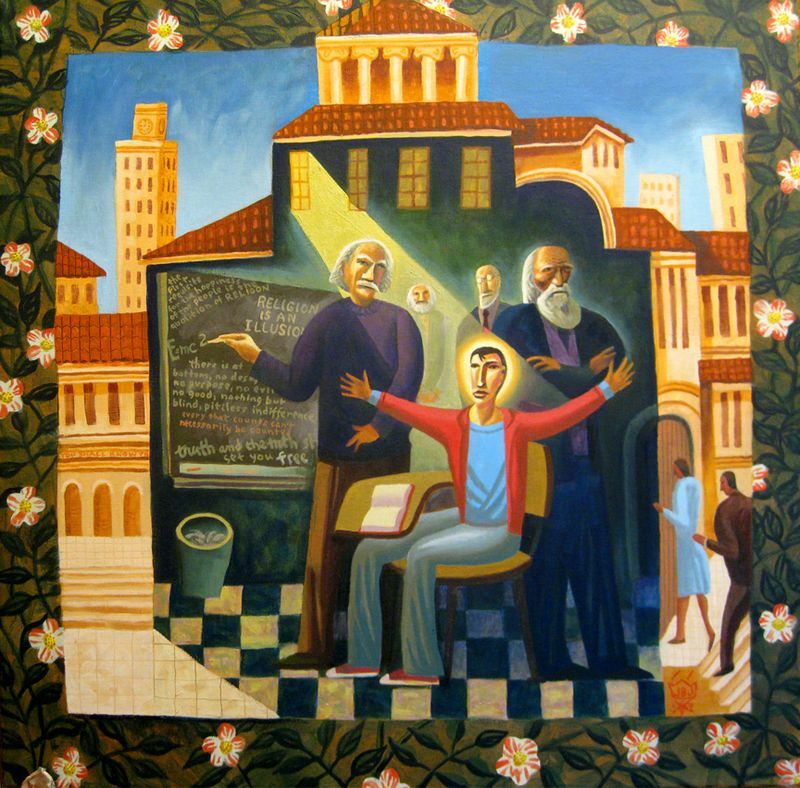 In the epistle reading, Saint Paul tells us ‘above all, clothe yourselves with love, which binds everything together in perfect harmony.’ He too points us to the teaching Christ, as our guide and teacher. When these parents returned home, Samuel ‘continued to grow both in stature and in favour with the Lord and with the people’ (I Samuel 2: 26), and in a similar way Jesus ‘increased in wisdom and in years, and in divine and human favour’ (Luke 2: 52). How Hannah held her fears and her hopes in her heart may have many parallels with the experience of Mary who ‘treasured all these things in her heart’ (Luke 2: 51). Some weeks ago, on the Second Sunday before Advent (18 November 2018), we read how Hannah had prayed during her annual pilgrimage to the Temple, promising that if God granted her a son she would dedicate him to the Lord. After returning home, she gave birth a son Samuel. When he was about three or four, Hannah took Samuel to Eli to serve in the Temple. 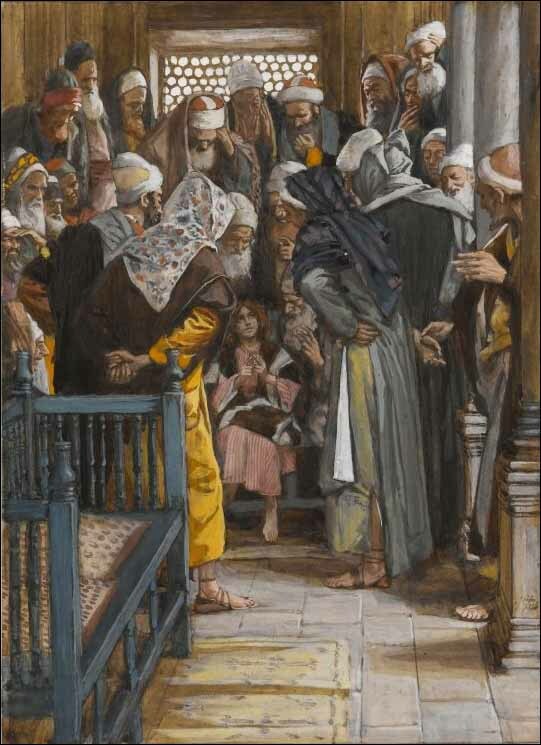 In next Sunday’s reading (I Samuel 2: 18-20, 26), the child Samuel is now like a boy-priest in the Temple, wearing the linen ephod or apron, the light ceremonial garment of a priest, and ‘ministering before the Lord’ (verse 18). The Hebrew word used here, שָׁרַת (sharath), is used particularly for liturgical worship by the priests, and the Septuagint translation, καὶ Σαμουηλ ἦν λειτουργῶν ἐνώπιον κυρίου, tells us Samuel is serving the liturgy in the sight of God. 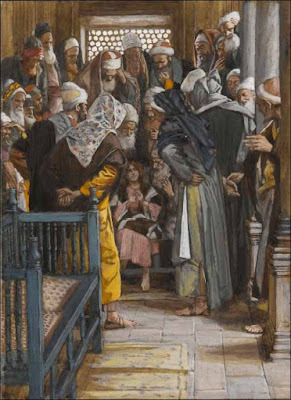 Hannah and her husband Elkanah continue to visit the Temple annually for the yearly sacrifice (verse 19), just as the Gospel reading tells us ‘every year the parents of Jesus went to Jerusalem for the festival of the Passover’ (Luke 2: 41). Hannah’s ‘gift ... to the Lord’ (verse 20) is her son, and when she returns home, Samuel continues to grow in stature and in favour with both God and the people (verse 26). Psalm 148 is one of the five hallelujah psalms at the end of the Book of Psalms that call on us to ‘Praise the Lord.’ But this invitation is not just to us, it is an invitation to the heavens, the angels, the sun, the moon, the stars, the skies and the seas, the sea monsters, the forces of weather, the mountains, hills and trees, all animals and birds. It is an invitation to all rulers, the young and the old, and all people. Colossae was a city near Laodicea in Phrygia in what is now south-west Turkey, east of Ephesus. The city was known for its angel cult, but also had a significant Jewish population, although most of the Christians seem to have been Gentiles. This letter gives descriptions of false teachings that were found in the churches in Colossae. The writer has already described the true Christian life. 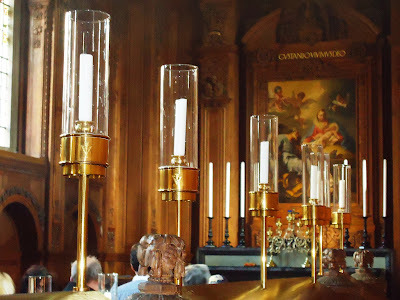 Now he tells them that because they are chosen by God, they are expected to live by the Christian virtues, including compassion, kindness, humility, meekness and patience. They are to be forgiving and, above all, to clothe themselves in love, ‘which binds everything together in perfect harmony’ (verse 14), and to let the peace of God rule in their hearts (verse 15). I remember once when one we lost sight of one of our children on an evening out in Crete over 25 years ago. He was about three or four at the time and was missing only for a few moments. It may have been for only three or four minutes, but the fear and panic that struck us made it feel not like three or four minutes as we searched and shouted out his name, but like an eternity. What was he doing, that he lost sight of us? Who did we blame? Did we ever thank those who helped our search? Christ is no longer a child in this Gospel reading. But Joseph and Mary do not yet see him as an adult. I can fully identify with them in their panic and in their fear in this Gospel reading. It was our pattern to go on holiday in Greece each summer, and we had felt safe, perhaps naively safe, wherever we were. 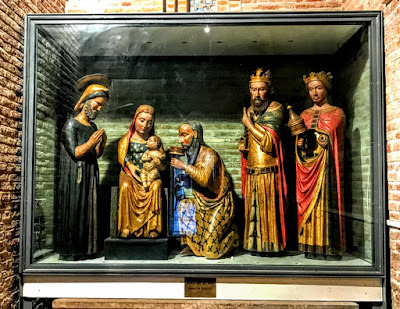 Perhaps, because they went to Jerusalem for the Passover each year, Saint Joseph and the Virgin Mary felt comfortable and relaxed as they moved through courts and the arcades of the Temple, and through the side streets and the market stalls of Jerusalem. On the way home, if Jesus was regarded still a child, he might have travelled with the women in the caravan; if he was now seen as a man, he might have been expected to travel with the men in the caravan. Any family travelling through a modern airport on holidays today, with the Father taking some children through and the Mother taking others, understands completely what may have happened at that Passover. If it is an experience you have forgotten, gone without out or have yet to go through, you can catch some of the flavour of the setting for this story by watching one of the all-time favourite Christmas movies, Home Alone (1990). Because Jesus is no longer a child in this story, yet not yet a man, some people introduce this Gospel reading as though it tells the story of the teenage Christ’s Bar Mitzvah. 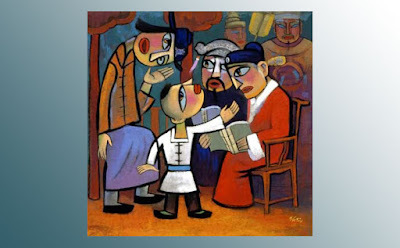 According to Jewish law, when a Jewish boy become 13 years old, he becomes accountable for his actions and become a bar mitzvah, literally ‘son of commandment,’ or subject Jewish law. 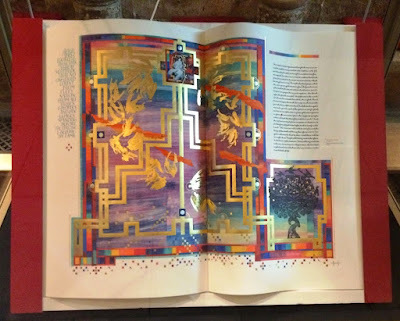 However, Jewish historians point out that the modern method of celebrating becoming a bar mitzvah did not exist in the time of the Bible, Mishnah or Talmud. 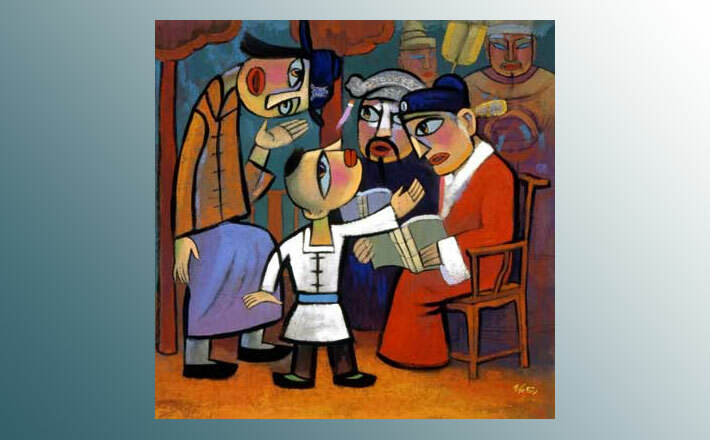 The Talmud gives 13 as the age at which a boy’s vows are legally binding, as a result of his being a man. 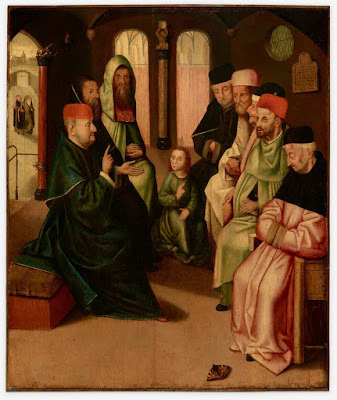 But the term bar mitzvah as we now use it cannot be clearly traced earlier than the 14th century, and many sources indicate that the ceremonial observation of a bar mitzvah developed in the Middle Ages. Nevertheless, the age 12 has long been the time when young people go through rites of passage, such as confirmation, so the timing of this Gospel story will resonate in many families. In his opening chapters, Saint Luke portrays Saint Joseph and the Virgin Mary as a devout and righteous couple. They observe the religious rites and practices of Judaism, they have Jesus circumcised (2: 21), and they are then said to have acted ‘according to the law’ three times (verses 22, 24, 39). In Sunday’s reading, Saint Luke tells us they go to the Passover festival in Jerusalem ‘every year.’ This emphasis on their participation is repeated in the next verse (42), and in many translations they are said to observe the ‘custom of the feast’ (KJV; see NIV); the significance of the word ἔθος (ethos), meaning not merely custom but usage prescribed by law, institute, prescription or rite, is lost in the NRSV translation. With this emphasis on the family’s religious devotion, Saint Luke is saying the Jewish boy Jesus grew up in a thoroughly Jewish world. 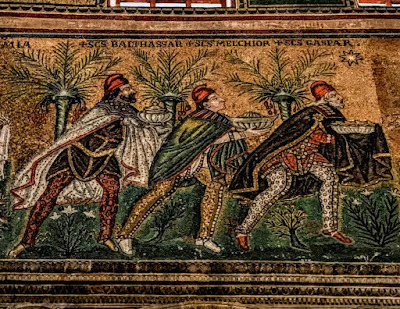 The setting for this story is the festival of the Passover, celebrating the deliverance from slavery in Egypt and then regarded as the start of a new year. Every year, Joseph, Mary and Jesus go to Jerusalem for this festival (verse 41), and they are still doing this in the year he is a 12-year-old (verse 42). When the eight-day festival ends, the people they have travelled with begin the long journey back home to Nazareth. The entourage in this caravan includes both ‘relatives and friends’ (verse 42), which makes it a safe group but also a large crowd. 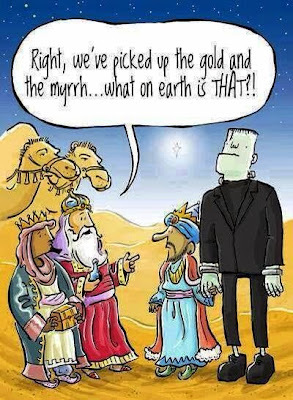 They have gone a full day, when Joseph and Mary realise he is missing. Perhaps they were about to have a meal together, perhaps they had the tents up or had arrived at a hostel or inn to stay the night. This was the rabbinical style of teaching at the time. The rabbis used questions from the students to create discussion. It was customary for the teacher or rabbi to sit on low pillows or chairs as they taught, while their disciples or students sat on the ground or on mats around them. 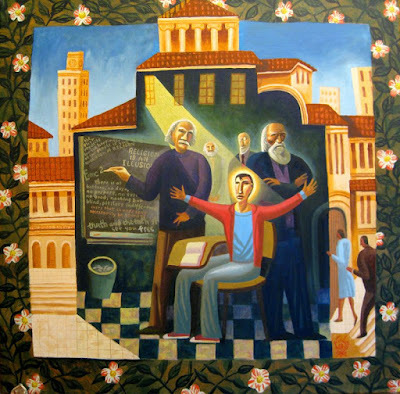 This practice gives us the expression ‘to sit at his feet,’ a description used, for example, when Mary sits at the feet of Jesus (see Luke 10: 39) and when Saint Paul describes himself as someone who was educated ‘at the feet of Gamaliel’ (Acts 22: 3). A rabbinic saying attributed to the second century rabbi, Yose ben Yoezer, says, ‘Let your house be a meeting place for the rabbis, and cover yourself in the dust of their feet, and drink their words thirstily’ (Pirkei Avos 1: 4). When Joseph and Mary find him, they are distraught as Mary asks, ‘Child, why have you treated us like this? Look, your father and I have been searching for you in great anxiety’ (verse 48). Mary’s remark is a reproach. She identifies Jesus as a ‘child’ for whom she and his ‘father’ (Joseph) have been searching. Indeed, she prefaces her final reproach with ‘look’ or ‘behold,’ which is an intensification, and specifically oriented towards the pain Jesus has caused his parents. Then, however, verse 49 marks a turning point in this Gospel. These are the first words Christ speaks in the Gospels. Until now, Joseph has been named as his father, but now Jesus refers to God as his Father. One thing is clear, however. Jesus uses the word δεῖ (dei), which means a bounden duty or ‘it is necessary.’ Saint Luke uses the word in certain special cases: Jesus ‘must proclaim the good news of the Kingdom of God’ (4: 43); he ‘must undergo great suffering’ (9: 22). In this case, he ‘must’ be about ‘his father’s’ business, work, laws teaching, and he means God in this instance, not Joseph. Did you notice, however, that Saint Joseph remains silent throughout this narrative? He is one of the most enigmatic characters in the Gospel stories. 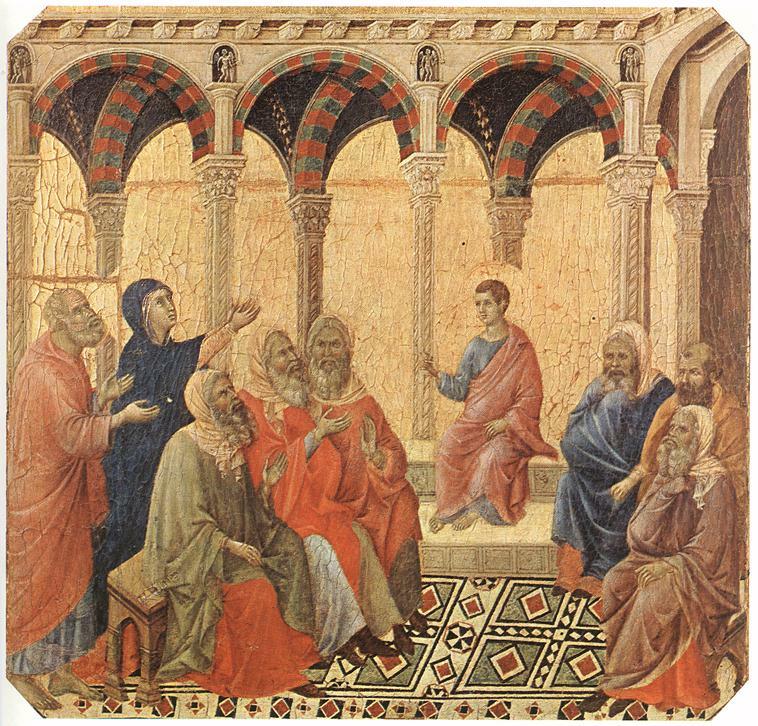 He features in both Saint Matthew’s Gospel and in Saint Luke’s Gospel, but not in either Saint Mark’s or Saint John’s Gospel. And after Mary and Joseph return from Jerusalem to Nazareth with the Child Jesus, Saint Joseph disappears from the stage again. Meanwhile, Mary and Joseph do not understand what Jesus says to them (verse 50). But, it is clear, things have changed radically and irreversibly. At the beginning of this story, Joseph and Mary do the action. They go to Jerusalem. They ‘went up.’ They ‘were returning.’ Yet, after the exchange between Mary and Jesus, it is Jesus who is the actor. ‘He went down with them’ to Nazareth. Once they have found Jesus, they probably have to travel back north to Nazareth by themselves, which was much more dangerous than traveling with a caravan. This is a danger understood by everyone who first heard the story of the Good Samaritan (Luke 10: 25-37). Perhaps this too is a literary hint at the later dangers in the journey that Jesus makes to Jerusalem. Saint Luke says that after this story, Jesus spent his years in Nazareth growing ‘in wisdom and in years, and in divine and human favour’ (verse 52). 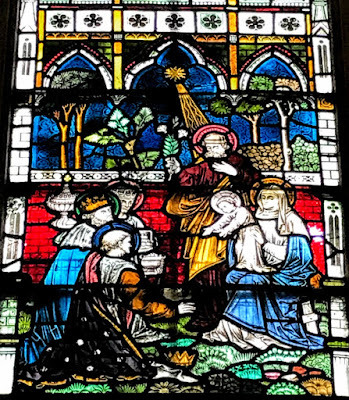 This is already said about him in the story of the Presentation (Candlemas): ‘The child grew and became strong, filled with wisdom; and the favour of God was upon him’ (Luke 2: 40). 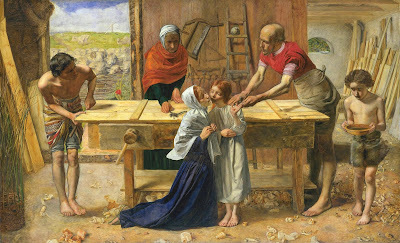 We might imagine he was apprenticed to Saint Joseph as a builder or carpenter, working in the family workshop, as depicted by the Pre-Raphaelite artist John Everett Millais (1829-1896) in his painting Christ in the House of His Parents (1849-1850). In the meantime, something has changed. Jesus is now on the way, on the path. When we next meet him in this Gospel, he is at the Jordan, about to be baptised by Saint John the Baptist, which is the Gospel reading (Luke 3: 15-17, 21-22) for the First Sunday after the Epiphany (13 January 2019). Throughout this story, Joseph and Mary are said to be looking for or seeking Jesus (verses 44, 45, 48, 49). On the third occasion, they say they were searching for him in great anxiety or seeking him and sorrowing; they were seeking him and anticipating the worst. 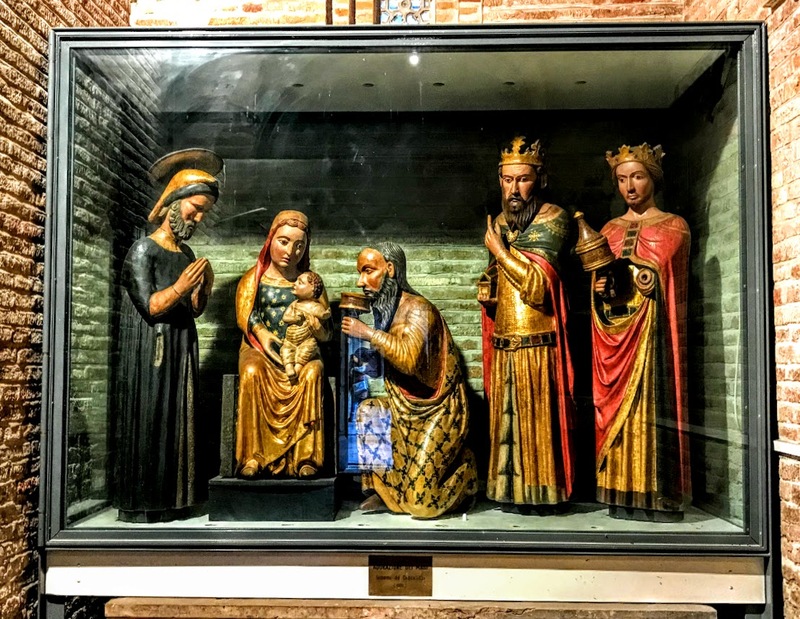 This not only identifies Mary and Joseph with every parent in their sorrow and plight as they search for a lost or missing child, but it puts them in the same position as the rest of us. Mary’s question to Jesus is probably not unfamiliar in most families. Most parents have probably asked Mary’s question either out loud or silently to themselves. But this also puts Mary and Joseph in the same position as the rest of us in the quest of faith. Later, ‘a great multitude of people’ also seek Jesus (6: 17-19). Later again, Jesus will also say that those who seek or search will find (11: 9) and that we are to seek or strive the Kingdom of God (12: 31). Still later in this Gospel, Jesus says he has come ‘to seek out and to save the lost’ (19: 10) – which is all of us, and not him. Why were they seeking him? As his parents, they were, quite understandably, very worried. Saint Luke tells us they were seeking him out of a sense of fear and loss. In other words, Joseph and Mary thought Jesus was the one who was lost. Albrecht Dürer painting of this story, ‘Jesus among the Doctors,’ is a sad example of late mediaeval art stooping to anti-Semitic stereotypes in his depiction of the teachers or rabbis in the Temple. 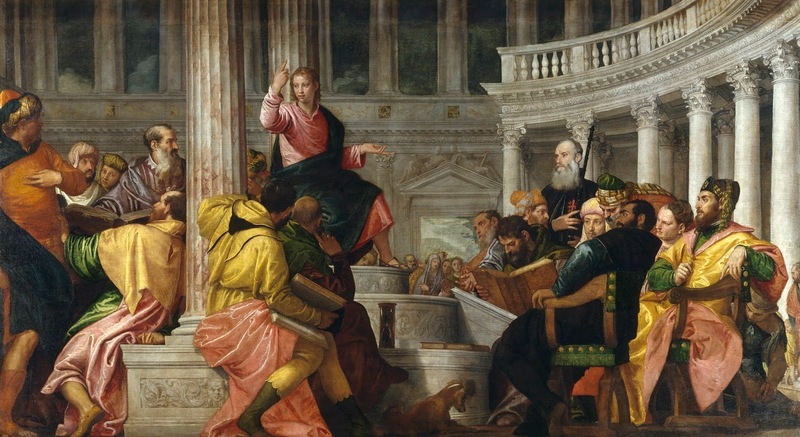 By recalling that Jesus was raised in a faithful and traditional Jewish family, Saint Luke assures his readers that Jesus and the Church are truly rooted in Jewish tradition. Jesus and the Church do not reject Judaism. They interpret Jewish convictions in light of the eschatological turning of the ages. This remains a challenge to and condemnation of anti-Semitism wherever it is found in the Church. Is there a possibility that when Mary and Joseph thought they had found Jesus ‘in the temple, sitting among the teachers, listening to them and asking them questions’ (verse 46) that they realised they had lost a child and found an adult? As they panicked, like all parents they would have thought of the time their lost child was once a baby. 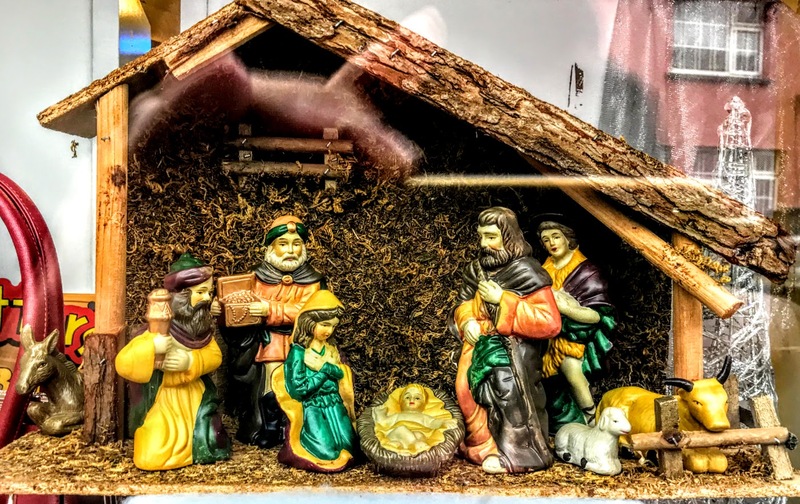 In this case as they looked at their 12-year-old son, did they see the baby once ‘wrapped in bands of cloth and lying in a manger’ (Luke 2: 12), rather than Jesus becoming the man, the Son of Man? Perhaps Mary and Joseph, like so many parents in this predicament and with a growing child at this age, were struggling with letting Jesus grow up. Sometimes we struggle with letting Jesus grow up. Would we prefer the Christ who comes to us in the now-romantic setting of the Christmas Crib, or the Christ who comes proclaiming the Kingdom of God and preaching its values? Christ is no longer the baby in the manger. He is in his Father’s house and about his Father’s business. Things are changing for him, for Mary and Joseph, and for us. Do we refuse to let our Jesus grow up? Would we prefer to keep him small and helpless, instead of challenging and questioning us in our most sacred places. Do we impose our needs, expectations, or emotional programmes on who Jesus is or what he does? Where do we seek Jesus? Where are our false temples, and where are our false comforts that become our false gods? 2, Isaiah 62: 6-12; Psalm 97; Titus 3: 4-7; Luke 2: (1-7) 8-20. It must be noted that there is a typographical error in the Church of Ireland Directory, which gives the Gospel reading in the third set as John 1: 1-4 (15-18), while the Book of Common Prayer (see p 28) specifically states John 1-14 (15-18). As I write, the third set seems to be ignored completely ‘Collects and Readings’ page on the Church of Ireland website. Why are there three sets of readings, and how do I avoid confusion as I plan services and sermons for Monday night and Tuesday morning? 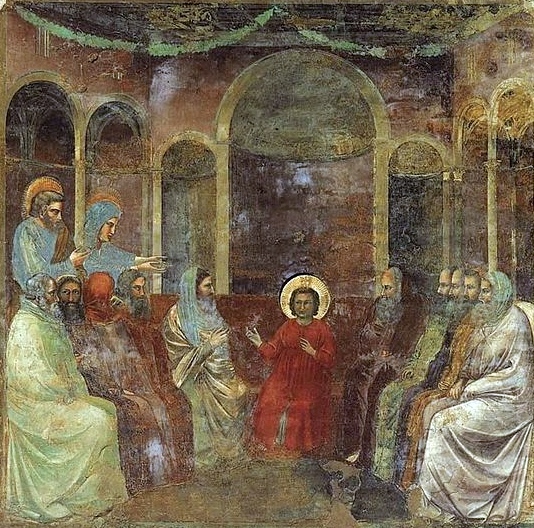 When the lectionary was first being compiled, it was assumed by the compilers that many people – not just priests – would take part in several celebrations of the Eucharist between midnight on Christmas Eve and lunchtime on Christmas Day, and so would want a rounded set of Gospel readings over a 12-hour period. The reason is simple: it leaves time free for festivities or to visit families and friends on Christmas Day. Most people are going to expect to hear ‘the Christmas story’ at the celebration they attend. 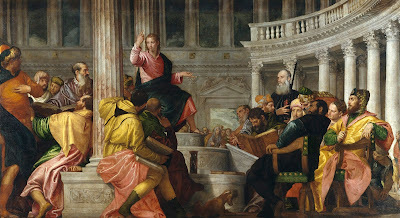 The Gospel reading provided in the first and second set (Luke 2: 1-20) comes closest to the account of that story in the Gospels, and most priests believe this is the most appropriate Gospel to read. This is probably the Gospel you want to use as you prepare your Christmas sermon. 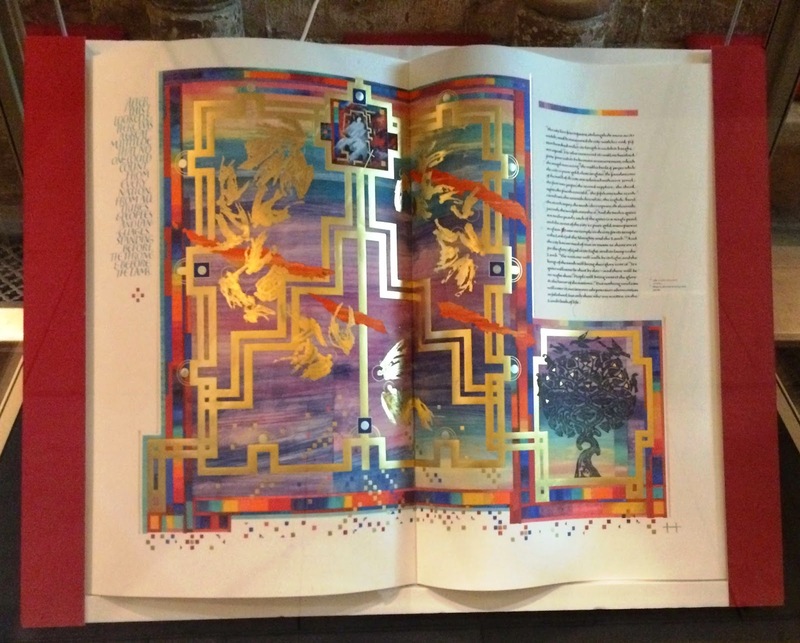 In some parishes, however, there may also be a tradition of using the shorter form of the prologue in Saint John’s Gospel (John 1: 1-14) found in the Lectionary. In addition, the Liturgical Resources for Christmas Day, including the Collect, Kyries, Peace, Preface, Post-Communion Prayer and Blessing, as well as prayers at lighting the last candle on the Advent Wreath and Hymn suggestions, are brought together here. And, as adults, we seem to constantly compare our present, adult Christmases, with our past, childhood Christmases. Saint Mark has no Nativity narrative, and has no story of the first Christmas. Instead, he begins his Gospel at the Baptism of Christ by Saint John the Baptist in the River Jordan, an event that comes a little later on in the other three Gospels. There is a telling, short sentence at the end of this Gospel reading: ‘Mary treasured all these words and pondered them in her heart’ (verse 19). At the heart of this Gospel narrative is the understanding that things are not always going to work out the way we would like them to. But at the heart of the Gospel story of Christmas is the truth that God is always with us, and that God’s expectations for us, God’s awe and wonder at being in our presence, should be as much a source of mystery as our awe and wonder at being in the presence of God. The initial task of the angels is to calm those fears. Their first words to those frightened shepherds are not ones of call or command, but words to calm them: ‘Fear Not’ … ‘Do not be afraid’ (verse 10). 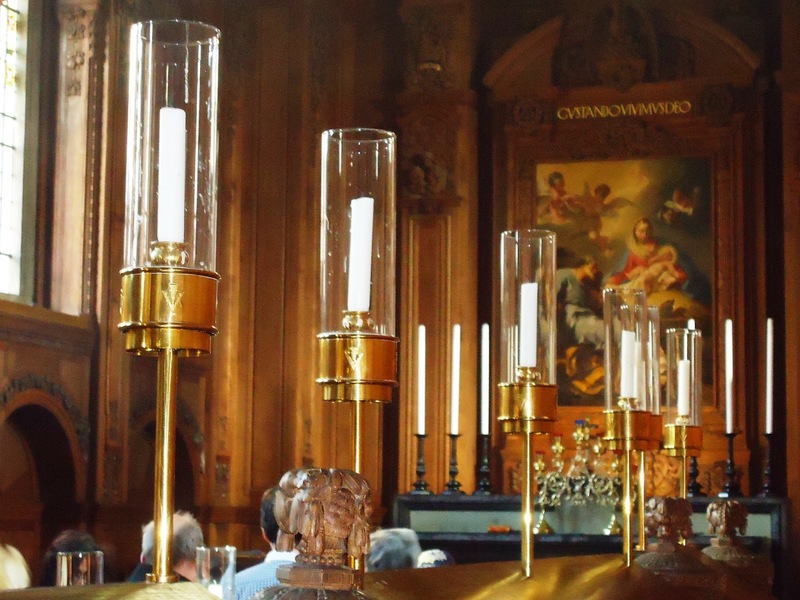 On a recent visit to Saint James’s Church, Piccadilly, I noticed a slogan: ‘Christ did not come so that we could have church and that more often. He came so we could have life and that more abundantly.’ For many people this Christmas, their principal fear is about life, the apprehension that they do not have the abundances to face the future without fear. The prayers at the Advent Wreath help us to continue our themes from the Sunday before Advent [25 November 2018], which we marked in these dioceses as Mission Sunday. As we light our Advent candles in anticipation of celebrating the coming of the Christ child, USPG is inviting churches and parishes to join in praying for the world church as it responds to the needs of the people and communities it serves.